Christmas is a very special time of the year for me. It brings fond memories of my childhood and I remember those happy days when all I had to do was to play (and go to school). Therefore I get really busy in early December and start to decorate the house with all kinds of hand crafted or bought ornaments. My husband and I bake lots and lots of Christmas cookies to eat and give away. I wouldn't want to miss that special joyous atmosphere! But this year was different. Very different. My husband and I spent half a year working in Beijing, China. As you may know, China is a country, where religion was forbidden during a long time and the Christian religion never played a role anyways. As time proceeded I became very nostalgic and was longing to go home. Can you imagine walking the streets in December, without any Christmas decoration? 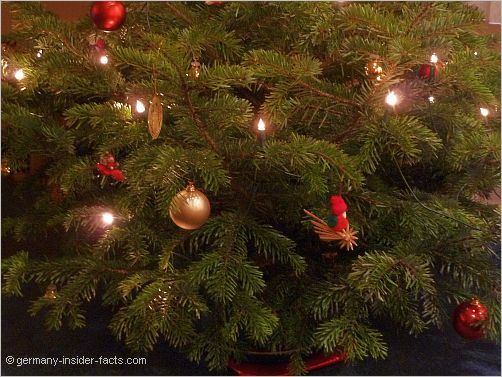 No lights, stars, candles, or even Christmas trees? It looked just like any other month of the year. Working in a German company, our office naturally closed on the 25th and 26th of December, but what would we do? We couldn't even buy Christmas cookies to make us feel better. Baking ourselves was out of the question, because our furnished apartment didn't even have an oven. Fortunately I wasn't the only one feeling nostalgic: a group of colleagues and friends from Germany, England, and even South Africa decided to make this our "Traditional Christmas away from Home". One of the German guys was married to a Chinese woman and she actually was the one to suggest baking cookies. We gathered the recipes for some of our favorite Christmas cookies like cinnamon stars and together with her we translated the ingredients first into English and second into Chinese. Then we went shopping together and she helped us to hunt down all the needed ingredients. What a relief! I started to become excited and soon got into the festive joyous mood I had so much missed. One Saturday afternoon we all met in her apartment to bake together. While some of us baked the cookies, the others crafted Christmas decorations and started planning for the Christmas Eve celebration. We had so much fun! In the evening the cookies were divided fairly amongst everyone and we still had some left to take to the office the next day. You should have seen the happy faces of our expat colleagues! Even the Chinese colleagues were thrilled to get a bite of German Christmas traditions. On Christmas Eve we all gathered again in her apartment to celebrate together. 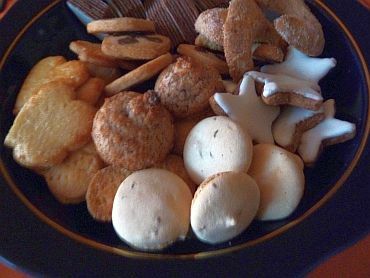 Everyone had brought a special dish from his or her country or region (apart from the cookies we had baked earlier). We brought a Bavarian potato salad, someone else had been able to buy almost authentic German sausages and the Chinese/German couple prepared a duck. We decorated the apartment with handcrafted stars, bows, and candles and put the presents under a small rubber tree. After dinner we opened the presents, which was a very special moment. I'm sure you know how that feels, when everyone is happy, cozy and feeling the Christmas spirit. But this time it was even more intense, because we were thousands of miles away from home, but still got to celebrate a German Christmas and enjoy that Gemütlichkeit. But the best part was still to come: our men had decided to make an authentic Feuerzangenbowle (a punch with lots of sugar and rum that is set on fire). 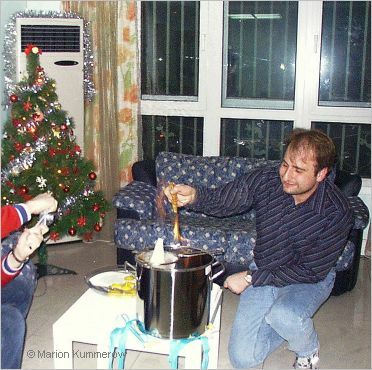 Mulled wine, widely available in Germany during Advent, wasn't known in Beijing. Soon we decided to make our own: use sweet read wine and throw in all the necessary spices like cloves, cinnamon, and orange peel. Then we needed a sugar loaf in form of a cone. The Chinese people didn't even understand what we meant and always tried to sell us normal sugar. But my hubby and his friends were very innovative (and messy) and started making their own sugar loaf. They crafted a cone-shaped container out of cardboard paper and squeezed wet sugar into the form, hoping it would dry and stay in cone shape. Can you imagine how that worked out? But when we dimmed the lights, and lit up the candles, all those hardships were forgotten. We sat down to enjoy the best ever Feuerzangenbowle and everyone felt that heartwarming Christmas spirit. It was an enchanted moment and nobody dared to say a word in order not to destroy that magical time. I can truly say, we celebrated a "Traditional German Christmas", even though we were half-way across the world. Marion Kummerow lives in Munich. 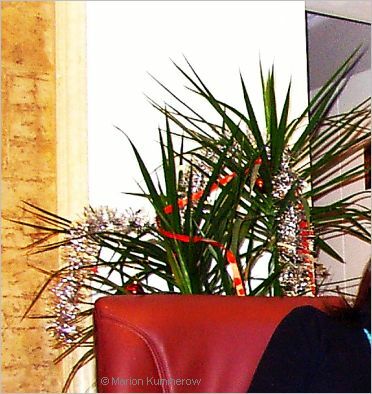 She operates the website inside-munich.com and writes ebooks on German topics in English and German. 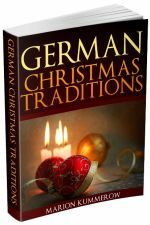 Of course, she wrote a book about Christmas in Germany.